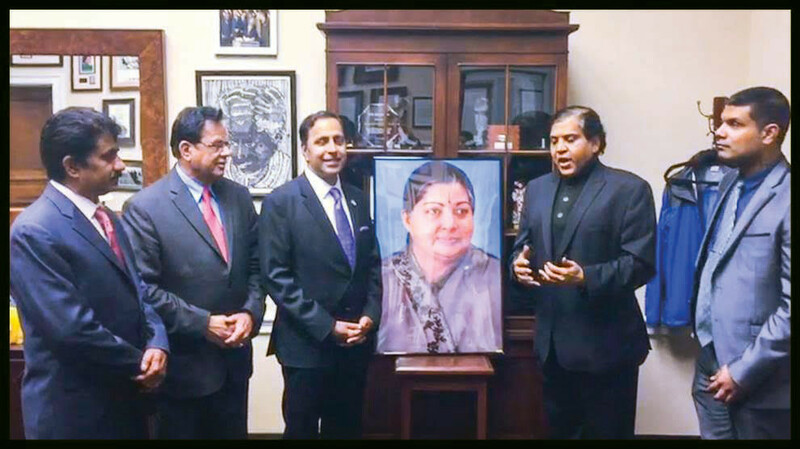 Home BREAKING NEWS Congressman Krishnamoorthi Attends Jayalalithaa Memorial Service In D.C. Congressman Krishnamoorthi Attends Jayalalithaa Memorial Service In D.C.
U.S. Congressman Raja Krishnamoorthi and Federation President Vijay G Prabhakar at the memorial service Jan. 4 at the U. S. Capitol Hill in Washington, D.C. The World Federation Of Tamil Youth, USA, headquartered in Chicago, organized a memorial service for former Tamil Nadu Chief Minister Jayalalithaa Jan. 4 at the U. S. Capitol Hill in Washington, D.C. The service was attended by lawmakers, including U.S. Congressmen Danny K Davis (D-Ill,) and Raja Krishnamoorthi ( D-Ill.) who led the memorial service by paying rich tributes to the late chief minister. Community activists from across the Unites States and Canada also attended the service. Congressman Krishnamoorthi praised the dynamic leadership of Jayalalithaa and her life that embodied her relentless fight for the poor. Davis described Jayalalithaa as a leader who inspired people across the globe by her innovative welfare programs and women’s empowerment initiatives. He highlighted Jayalalithaa’s connection with the masses that endeared her to all. Vijay G. Prabhakar, president, World Federation of Tamil Youth, USA, recalled his long association with Jayalalithaa since 1977 when he interviewed her for All India Radio Yuva Vani program in Chennai as a student of Madras Medical College. Prabhakar hoped that the endearing legacy of Jayalalithaa will be carried on by the members of the AIADMK under the leadership of Chinnamma, Sasikala Natarjan, to make Tamils proud all over the world. Kishor Mehta, chairman, multi ethnic advisory task force, 7th Congressional District, IIlinois, Nagender Sripada of IIT-Chennai Alumni Association, USA, Pratap Kumar, founder, association of Tamil Nadu Medical Graduates-USA, Shama Patel of MEATF International Woman Day Celebrations Committee, Oak Park, Ill. and Kokilan Kulathagir, Canada chapter president, WFOTY, USA among others, paid glowing tributes to Jayalalithaa. King Sundar, vice president, WFTY, USA, welcomed the gathering. Parthiban Shanmugam, Treasurer, WFOTY, USA said the federation, since its inception in 1992, had celebrated amma’s birthday in the U.S. with welfare programs for the aged and disabled. This, he said, will continue to be celebrated to reach out to more people every year. The highlight of Jayalalithaa’s birthday celebrations is that the federation selects an individual every year to receive the Jayalalithaa Award.